It's normal for the tinted egg laying chickens and ducks to lay the darkest colored eggs when they first start laying, then the shade slowly fades as they bird ages. 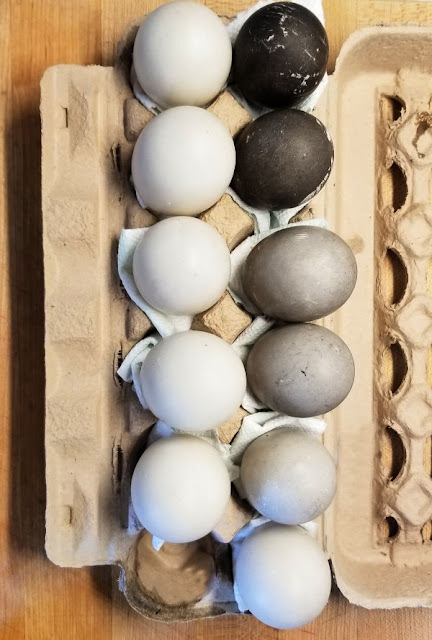 Each spring, the egg color might start out dark again, then fade into the summer. 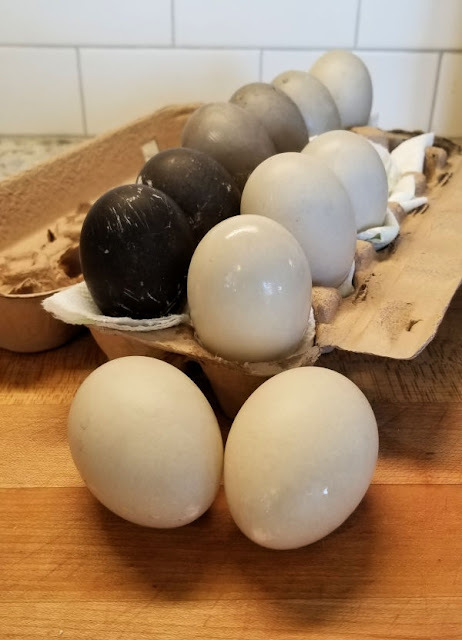 But most likely Kiwi has already laid her blackest eggs, so I couldn't bring myself to cook them. I definitely wanted to save them. In order to be sure her eggs would last, I needed to blow them out. It's a simple process once you get the hang of it. 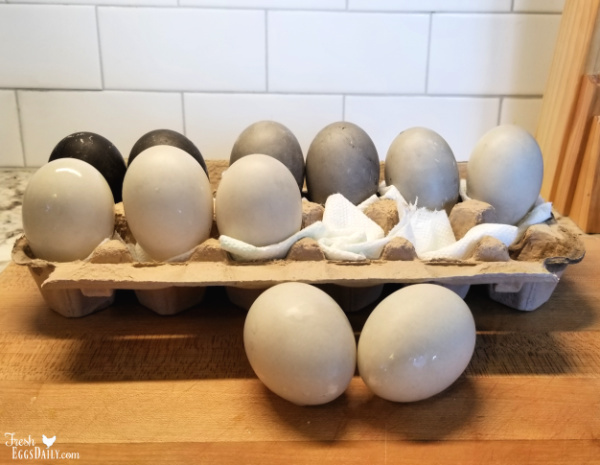 Since Easter is coming up, I thought that sharing a tutorial of step by step instructions how to blow out eggs was in order, since dyeing raw eggs, then blowing them out is a great way to create a permanent display you can use year after year! 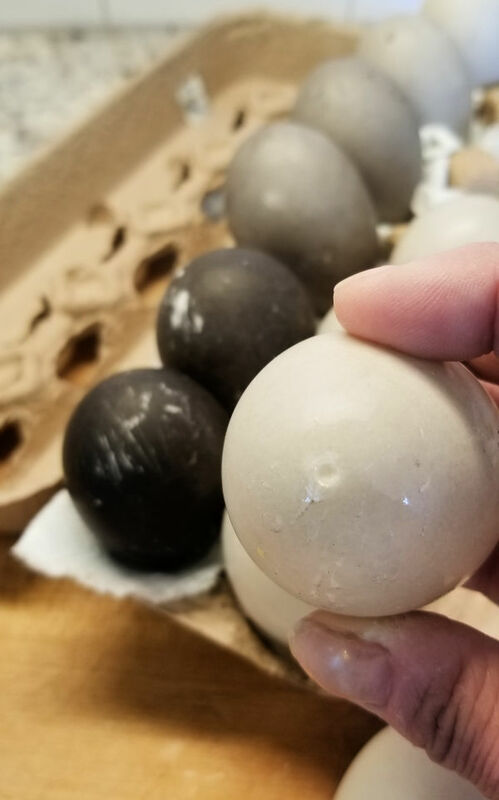 Duck or chicken or even quail or goose eggs all can be blown out the same way. It's easy to learn how to blow out eggs, but can be tricky to get the hang of applying just the right amount of pressure to empty the egg without breaking it, so it's best to practice on a few eggs you don't care so much about first until you feel confident in your skills! 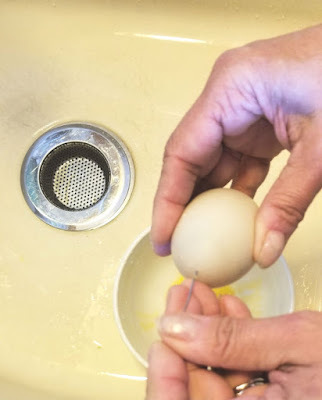 You can use a safety pin and make a hole at each end, scramble the insides, then gently blow the yolk and white out the bottom hole while blowing into the top hole with your mouth (but really? yuck! ), or you can invest in an egg blowing kit, which is what I did. 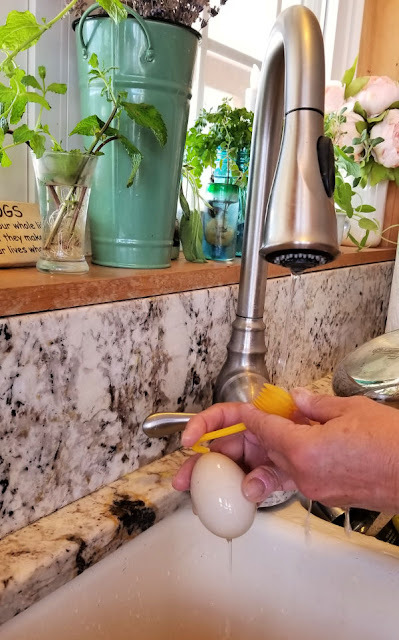 By using the egg blowing kit, you only need to make one tiny hole in the shell, not two, and plus its way more sanitary. 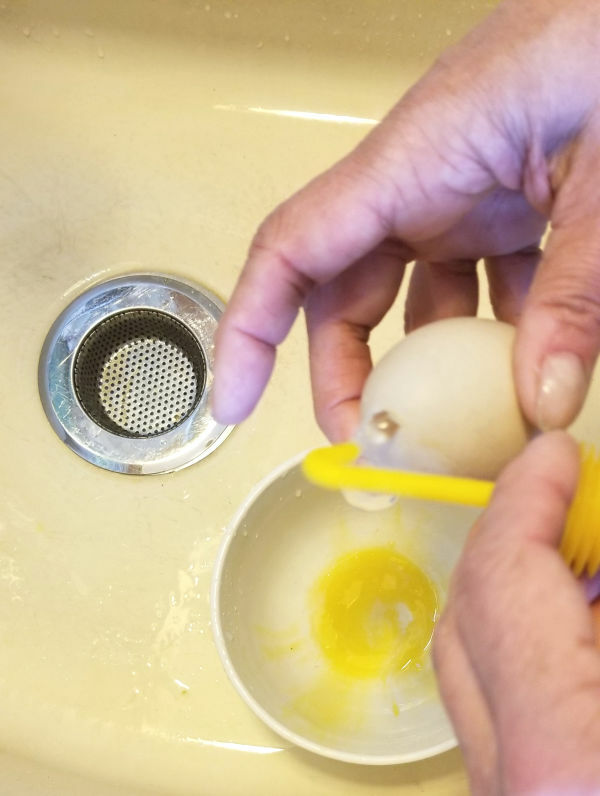 Step 1: Using a pin, make a small hole in the pointy end of your egg. Step 2: Twirl the pin around to "scramble" the insides and break the yolk. 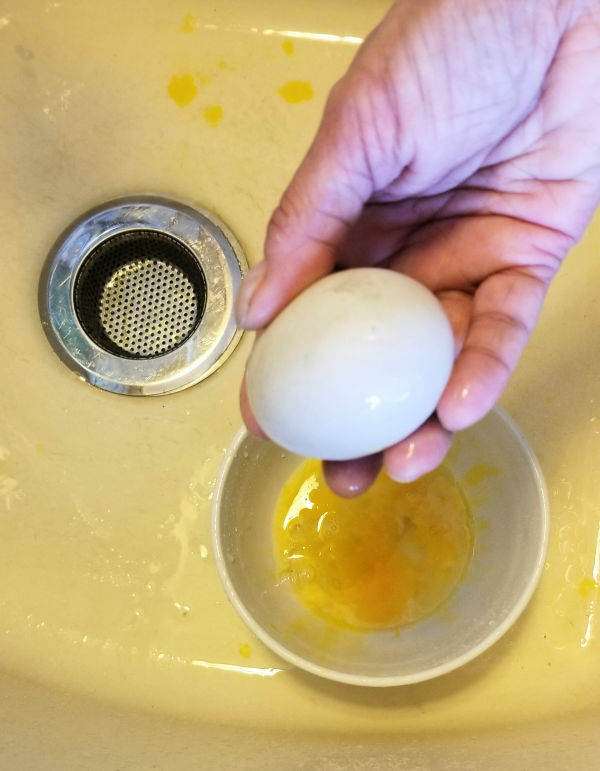 Step 3: With the hole facing down, hold the pump to the hole and squeeze several times, forcing the insides of the egg out through the hole into a bowl or the sink. 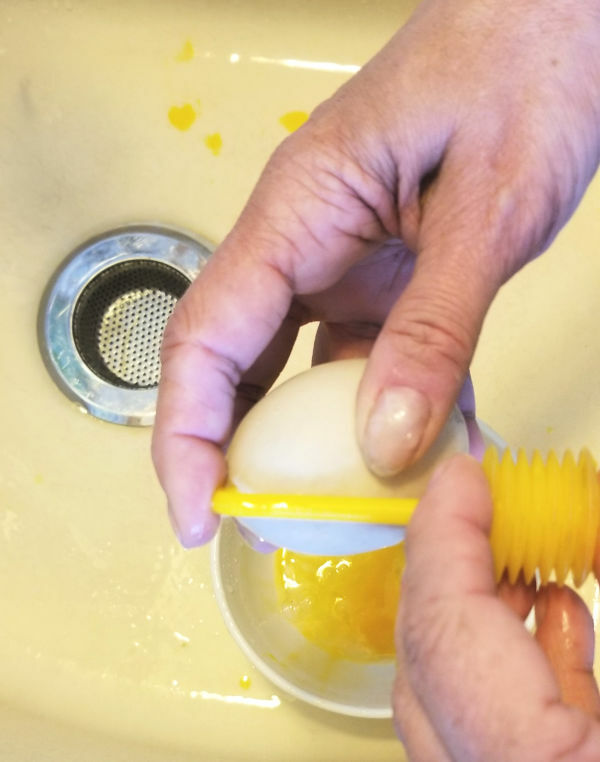 Do this gently so you don't break the egg. Step 4: Repeat, pumping several times, then allowing the egg to drain out. 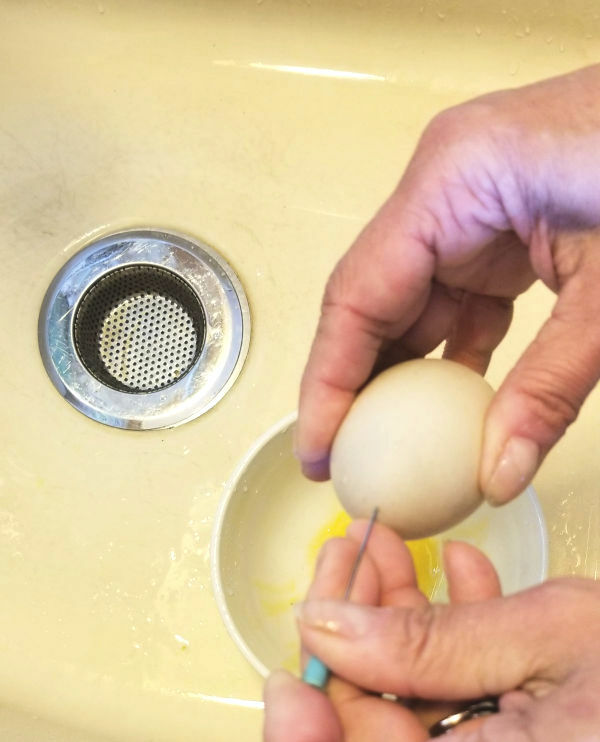 If you aren't seeing any yolk come out, use the pin again the swish around the insides. 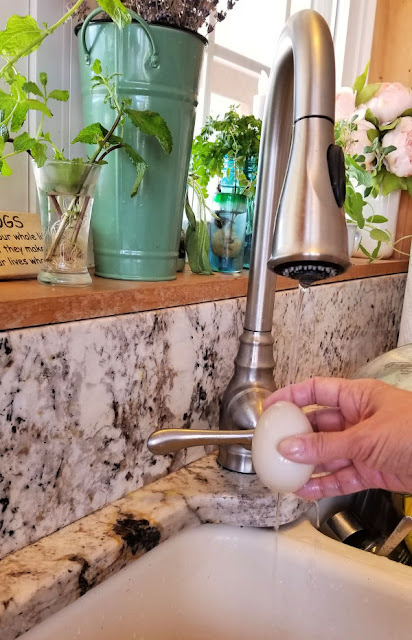 Step 5: Once the egg is empty, fill the pump with running water from the tap and pump the water into the shell (or you can use a mixture of white vinegar and water which will further sanitize the egg). 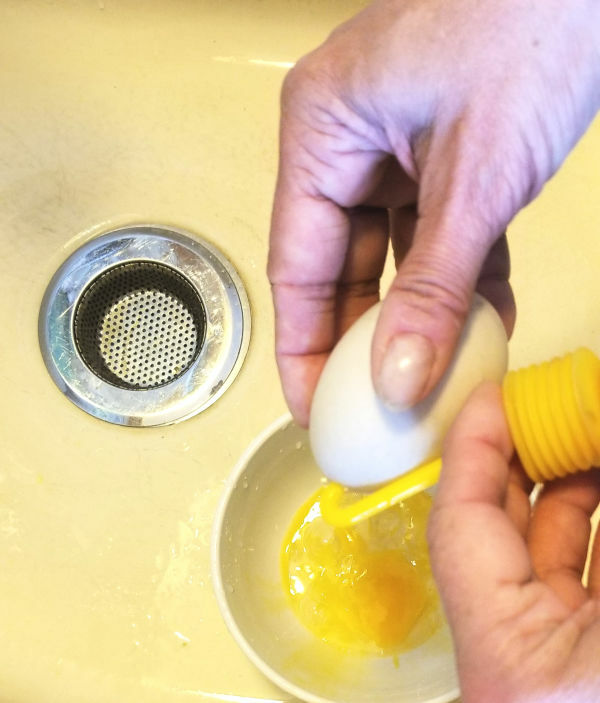 Step 6: Hold your finger over the hole and shake the egg. Step 7: As you did in Step 3, pump out the water in the egg through the hole. Continue repeating steps 5-7 until the water coming out of the egg runs clear. Step 8: Nestle a piece of paper towel into each compartment of the egg carton. Step 9: Set the eggs to dry with the hole pressed against the paper towel. 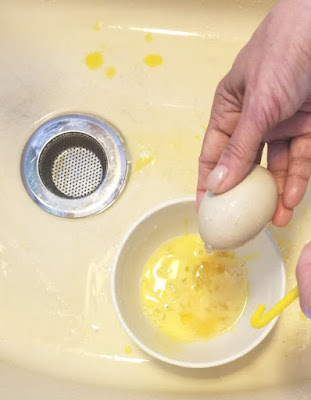 Step 10: Once completely dry, the eggs can be wiped with some olive oil or vegetable oil on a soft cloth or even polyurethaned or brushed with Modge Podge for a shiny, permanent coating.